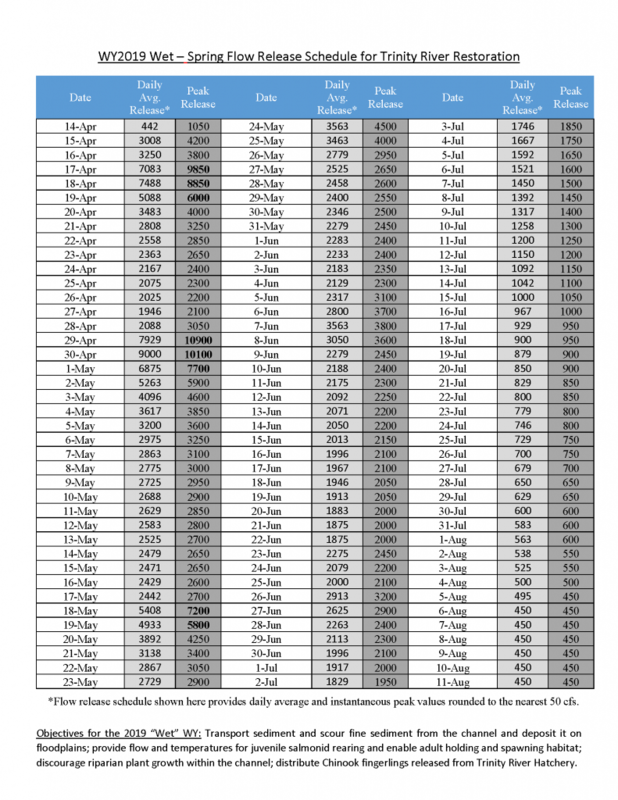 Water Year 2019 is forecast as a Wet year based upon the California Department of Water Resources Bulletin 120 median forecast for April 1. 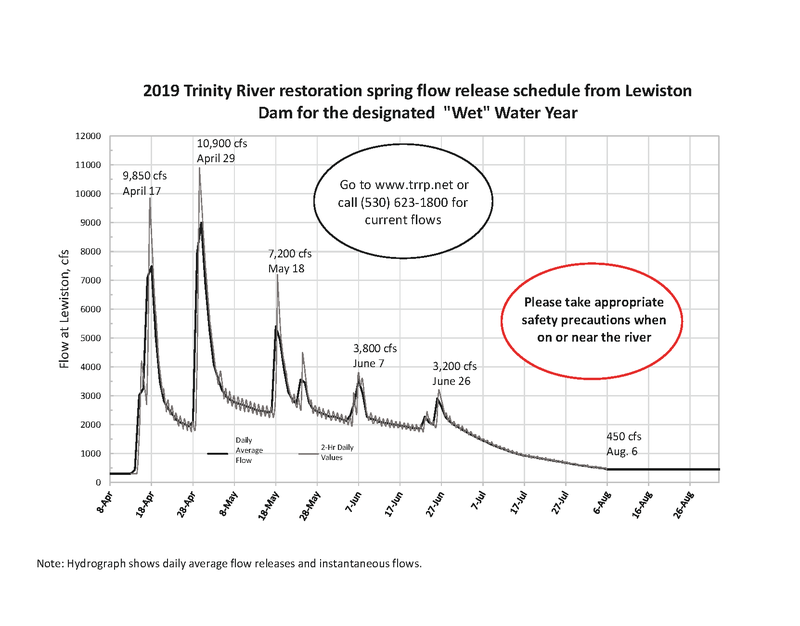 The forecast is for 1,595,000 acre feet of inflow to Trinity and Lewiston Reservoirs over the water year, which allocates 701,000 acre feet to the Trinity River under the 2000 Record of Decision. The Wet Water Year 2019 approved hydrograph to be implemented may be downloaded here (pdf). You may subscribe to our Automated Flow Release Notifications. Actual releases may not always follow the flow schedule – see our Flow FAQ page for details. Based on early water year forecasts in February and March, technical representatives of the Trinity River Restoration Program develop flow release recommendations to meet various restoration objectives and management targets listed in Chapter 8 of the Trinity River Flow Evaluation Final Report [PDF – 10mb]. Deliberations start with the typical flow release schedule recommended in the Record of Decision that may be adapted to meet specific restoration needs for the current year. The flow recommendations are then presented to the Trinity Management Council (TMC) in March or early April for consideration. A ‘summary of water conditions’ as of April 1st of the year, is published by the California Department of Water Resources on or about April 10; this includes a forecast of reservoir inflow for the water year, known as the ‘b120 forecast’, which establishes the water year type and volume for restoration of the Trinity River. The flow release recommendation approved by the TMC is then forwarded to the Bureau of Reclamation and U.S. Fish and Wildlife Service as CVPIA co-lead agencies for the U.S. Department of Interior, which has the final authority over dam releases. Most data shown here are from the USGS via the waterservices site, plus the USBR and CDWR via the California Data Exchange. Data are provisional and may be recalculated before final approval. The TRRP site checks for new sub-daily values every 15 minutes and for new daily values twice per day. Note that “Full Natural Flow” is an automated estimate from CDWR of the flow that would naturally pass the Trinity Dam site if unimpeded – it is very sensitive to small variations in lake level measurements that may result in negative values when flows would naturally be low, but is more useful for storm events, snowmelt, and averages over longer times. The graphic for water released to the Trinity River versus the water diverted to the Central Valley tends to show higher values for the river ​until summer, when water exports ​to the Central Valley ​typically increase. Click here for a summary of Trinity River flow volumes. The TRRP website follows the intent of the DOI disclaimer.